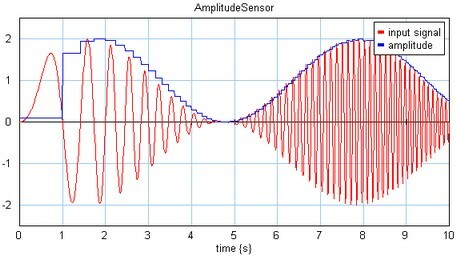 This model measures the amplitude of harmonic signals, i.e. periodic signals, that go through zero twice every period. For half a period (between the passes through zero) the input signal is monitored. The largest value is stored and given as the absolute output signal, the next half period. That is why this sensor always has an output delay of half a period.